Not to be confused with Ed Wynne. Forest Lawn Memorial Park Glendale, California, U.S.
Wynn was born Isaiah Edwin Leopold in Philadelphia, Pennsylvania. His father, Joseph, who manufactured and sold women's hats, was born in Bohemia. His mother, Minnie Greenberg, of Romanian and Turkish ancestry, came from Istanbul. Wynn attended Central High School in Philadelphia until age 15. He ran away from home in his teens, worked as a hat salesman, and as a utility boy, and eventually adapted his middle name "Edwin" into his new stage name, "Ed Wynn", to save his family the embarrassment of having a lowly comedian as a relative. Wynn began his career in vaudeville in 1903 and was a star of the Ziegfeld Follies starting in 1914. During The Follies of 1915, W. C. Fields allegedly caught Wynn mugging for the audience under the table during Fields' Pool Room routine and knocked Wynn unconscious with his cue. 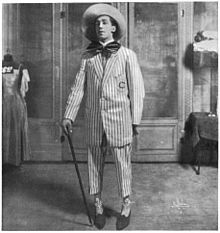 Wynn wrote, directed, and produced many Broadway shows in the subsequent decades, and was known for his silly costumes and props as well as for the giggly, wavering voice he developed for the 1921 musical revue, The Perfect Fool. Wynn was offered the title role in MGM's 1939 screen adaptation of The Wizard of Oz, but turned it down, as did his Ziegfeld contemporary W. C. Fields. The part went to Frank Morgan. Ed Wynn first appeared on television on July 7, 1936 in a brief, ad-libbed spot with Graham McNamee during an NBC experimental television broadcast. In the 1949–50 season, Ed Wynn hosted one of the first network, comedy-variety television shows, on CBS, and won both a Peabody Award and an Emmy Award in 1949. Buster Keaton, Lucille Ball, and The Three Stooges all made guest appearances with Wynn. This was the first CBS variety television show to originate from Los Angeles, which was seen live on the west coast, but filmed via kinescope for distribution in the Midwest and East, as the national coaxial cable had yet to be completed. Wynn was also a rotating host of NBC's Four Star Revue from 1950 through 1952. After the end of Wynn's third television series, The Ed Wynn Show (a short-lived situation comedy on NBC's 1958–59 schedule), his son, actor Keenan Wynn, encouraged him to make a career change rather than retire. The comedian reluctantly began a career as a dramatic actor in television and movies. Father and son appeared in three productions, the first of which was the 1956 Playhouse 90 broadcast of Rod Serling's play Requiem for a Heavyweight. Ed was terrified of straight acting and kept goofing his lines in rehearsal. When the producers wanted to fire him, star Jack Palance said he would quit if they fired Ed. (However, unbeknownst to Wynn, supporting player Ned Glass was his secret understudy in case something did happen before air time.) On live broadcast night, Wynn surprised everyone with his pitch-perfect performance, and his quick ad libs to cover his mistakes. A dramatization of what happened during the production was later staged as an April 1960 Westinghouse Desilu Playhouse episode, "The Man in the Funny Suit", starring both senior and junior Wynns, with key figures involved in the original production also portraying themselves. Ed and his son also worked together in the Jose Ferrer film The Great Man, with Ed again proving his unexpected skills in drama. Requiem established Wynn as a serious dramatic actor who could easily hold his own with the best. His performance in The Diary of Anne Frank (1959) received an Academy Award nomination for Best Supporting Actor. Also in 1959, Wynn appeared on Serling's TV series The Twilight Zone in "One for the Angels". Serling, a longtime admirer, had written that episode especially for him, and Wynn later in 1963 starred in the episode "Ninety Years Without Slumbering". For the rest of his life, Wynn skillfully moved between comic and dramatic roles. He appeared in feature films and anthology television, endearing himself to new generations of fans. Wynn was caricatured in the Merrie Melodies cartoon shorts Shuffle Off to Buffalo (1933) and I've Got to Sing a Torch Song (1933), and as a pot of jam in the Betty Boop short Betty in Blunderland (1934). He appeared as the Fairy Godfather in Jerry Lewis' Cinderfella. His performance as Paul Beaseley in the 1958 film The Great Man earned him nominations for a Golden Globe Award for "Best Supporting Actor" and a BAFTA Award for "Best Foreign Actor". The following year he received his first (and only) nomination for an Academy Award for Best Supporting Actor for his role as Mr. Dussell in The Diary of Anne Frank (1959). Six years later he appeared in the Bible epic The Greatest Story Ever Told. Wynn provided the voice of the Mad Hatter in Walt Disney's film, Alice in Wonderland and played The Toymaker alongside Annette Funicello and Tommy Sands in Walt Disney's Babes in Toyland released in 1961. Possibly his best-remembered film appearance was in Walt Disney's Mary Poppins (1964), in which he played eccentric man Uncle Albert floating around just beneath the ceiling in uncontrollable mirth, singing "I Love to Laugh". Re-teaming with the Disney team the following year, in That Darn Cat! (1965) featuring Dean Jones and Hayley Mills, Wynn filled out the character of Mr. Hofstedder, the watch jeweler with his bumbling charm. He also had brief roles in The Absent Minded Professor (as the fire chief, in a scene alongside his son Keenan Wynn, who played the film's antagonist) and Son of Flubber (as county agricultural agent A.J. Allen). His final performance, as Rufus in Walt Disney's The Gnome-Mobile, was released a few months after his death. In addition to Disney films, Wynn was also an actor in the Disneyland production The Golden Horseshoe Revue. Wynn died June 19, 1966 in Beverly Hills, California of throat cancer, aged 79. He is interred at Forest Lawn Memorial Park in Glendale, in The Great Mausoleum, Daffodil Corridor, Columbarium of the Dawn, alongside his son Keenan Wynn, his granddaughter Emily Wynn (February 13, 1960 – November 27, 1980), who died from lupus and his sister-in-law, Blanche Einstein Leopold (May 18, 1880 – December 26, 1973). His bronze grave marker reads "
According to his granddaughter Hilda Levine, Walt Disney, who died a few months later, served as one of his casket bearers. Red Skelton, who was discovered by Wynn, stated: "His death is the first time he ever made anyone sad." Wynn's distinct voice was deliberately emulated by Alan Tudyk for the character King Candy in Disney's animated film Wreck-It Ralph. Wynn was posthumously named a Disney Legend on August 10, 2013. Manhattan Mary (1927) – musical – actor in the role of "Crickets"
Hooray for What! (1937) – musical – actor in the role of "Chuckles"
^ Obituary Variety, June 22, 1966, page 71. ^ Wilfred T. Neill (January 2, 1979). "Famed comedian Ed Wynn once owned theater in New Port Richey". St. Petersburg Times. Retrieved September 19, 2008. ^ a b c Biography of Ed Wynn at Turner Classic Movies. ^ "New York Hoorays for Ed Wynn" , LIFE, December 20, 1937, p. 46, accessed May 31, 2011. ^ "August Clown" , LIFE, July 26, 1948, p. 74, accessed May 31, 2011. ^ "August Clown" , LIFE, July 26, 1948, p. 70, accessed May 31, 2011. ^ McLeod, Elizabeth. "Tonight The Program's Gonna Be Different!The Life and Times of Ed Wynn, The Fire Chief". Old Time Radio Researchers Group. Retrieved June 2, 2015. ^ "The Ed Wynn Show, 1950". Internet Archive – Moving Image Archive. Retrieved December 8, 2014. ^ Cerabona, Ron (April 29, 2013). "Giving Voice to an Old-Timer". The Sydney Morning Herald. Retrieved August 7, 2016. Wikimedia Commons has media related to Ed Wynn. The Ed Wynn Show at Classic TV Info. Four Star Revue/All Star Revue at Classic TV Info.